He has led the UK restaurant scene for 25 years and is regarded by many to have single-handedly dragged it to what it is today. He helped kick-start the careers of many famous chefs including Gordon Ramsay, Heston Blumenthal and Jason Atherton, all of whom trained under him. Marco's imminent success began when, at the age of 17, he went to London to train in classical French cooking with Albert and Michel Roux at Le Gavroche. He later went on to work with Raymond Blanc and Pierre Koffman, both renowned for their French cooking techniques. Marco opened his own restaurant, Harveys, in 1987 where he got his first Michelin star that year and his second the following year. 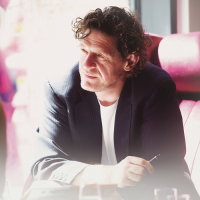 He finally won his third Michelin star in 1995 at The Restaurant Marco Pierre White in the Hyde Park hotel London, becoming the first British chef and youngest chef worldwide, at the age of 33, to win three stars. By 1999 Marco had achieved everything a chef would endeavour to become and so he finally hung up his apron on 23rd December, retiring from the kitchen. Following his retirement, Marco took time out to spend it with his family and enjoy his hobbies, fishing and shooting. Having become an icon and an inspirational chef, in 2007 Marco jumped back in to the public eye with major TV roles in Hell's Kitchen, The Great British Menu (2008) and Australian Master Chef (2011). A major shareholder in Black and White Hospitality, he is now dedicated to rolling-out his restaurant concepts to share his love and passion for food. Focusing on delivering good, quality food at affordable prices his brands include Marco Pierre White Steakhouse Bar & Grill, Marco’s New York Italian, Mr White’s English Chophouse, Wheeler’s of St James’s Oyster Bar & Grill, Bardolino Pizzeria Bellini & Espresso Bar and Marconi Coffee and Juice Bar. With the 50th UK-based venue just around the corner, Marco has just opened the first of an exciting new brand called Koffmann & Mr White’s, which is an English and French Brasserie created with his former mentor Pierre Koffmann. Marco is also taking his philosophy on dining out overseas and will see the first two international restaurants opening in Abu Dhabi in 2019.